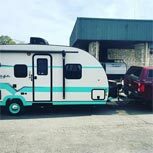 If you've decided you want to finance your new truck camper, folding camper, tear drop, travel trailer or toy hauler, you're not alone. Seventy percent of enthusiasts do. With a minimum down payment and approved credit, you can arrange credit financing with us and get out on the road a few hours after picking out your truck camper, folding trailer, teardrops, travel trailers toy or haulers. And because we finance more Adventurer , Aliner , EverGreen, Lance , Little Guy , Livin Lite , Northwood , Palomino , Travel Lite than anyone else, we understand your special needs. Only someone who knows how you feel when you hit the starter button understands that hitting the road ASAP is your biggest concern. That's why we make it easy. Princess Craft is pleased to work with RV America to find you the best rates and coverage for your camper. RV America has helped insure truck campers, travel trailers and RVs since 1979… No other company knows RV insurance better. They work with only top-rated insurers across the nation to provide protection for RVs and tow vehicles. Companies like Progressive, National Interstate, Allied, Blue Sky, American Modern, McGraw, Dairyland, Assurant, Foremost, SafeCo, Mercury, Met-Life, and GMAC all work with RV America to bring security to RV adventurers all across America. Click the link below and in just a few minutes, RV America will show you the most competitive rates and coverage in their network so you can begin your adventures worry free!